I have finished up a batch of Customeeple buildings for an Infinity terrain commission. These buildings are all MDF and acrylic kits that capture the sci-fi style of Infinity well. There are a lot of flat surfaces and hard edges that lend themselves to extreme edge highlighting. I would not normally go this hard on the edge but that was the style the client was looking for. 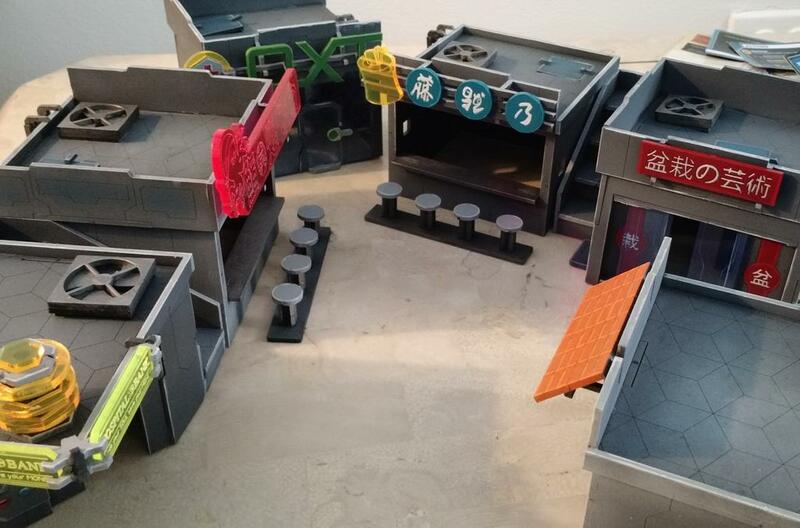 The commission composed of six separate buildings from various Neon City Panoceania and Neon City Yu Jing small building kits. As much as I like the look of the final product, I cannot recommend these kits to anyone. I must give credit to Customeeple for nailing the Infinity style. However, these were some of the most difficult and frustrating model kits I have ever built. I do not say that lightly and I am not prone to hyperbolic statements. I have been building models in some form or another for over 15 years. That experience did not ease my struggle. 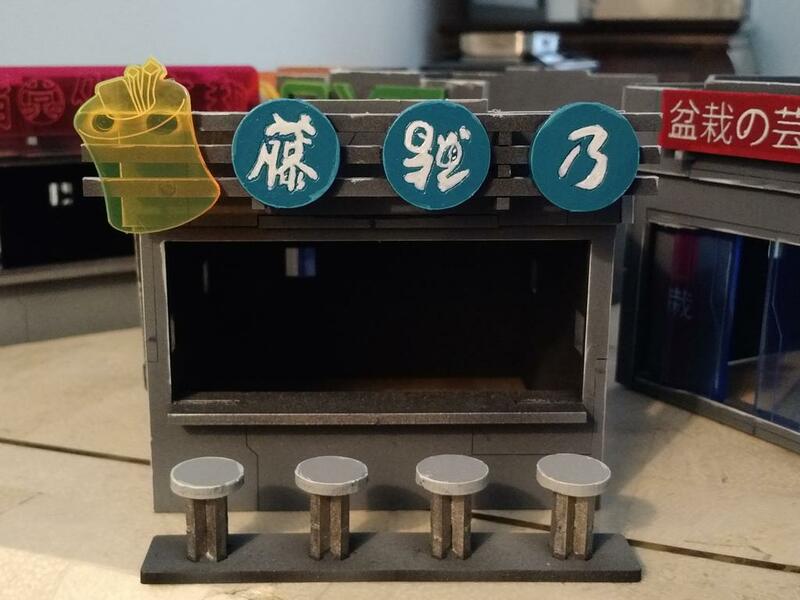 According to the Customeeple website, “All our NEON CITY products have a similar structure, easy to assemble, that could be constructed in different configurations.” I take extreme issue with the phrase “easy to assemble”. These kits were an enormous pain to construct and the included one-page instructions were next to useless. I had to constantly reference the photos on the Customeeple website for guidance during the build to try and figure out how these buildings were meant to go together. Coupled with the unclear instructions is the added frustration of the pieces not being cut precisely enough to fit together without some serious trimming and filing. Walls, doors, roofs and windows once punched out of the MDF frame do not line up as they should and need to be cut down to size. Some of the joins are so bad that you cannot even get a proper dry fit while trying to line up the structure. Most of the buildings include colored acrylic bits for signage. Once the buildings are built, painted and have the acrylic added they look great on the table. However, the kits are designed in such a way that they cannot be fully built and then painted. This is because the acrylic must be added last and if added sooner would run the risk of being painted over. These fact means there was a huge amount of sub-assembly required. Sub-assembly is a pain. Sub-assembly on a kit that is already a difficult build, is a nightmare. There is one part of these kits that I do like. A lot actually. The ladders, doors, hatches and air vents are all individual and independent of the larger structure. 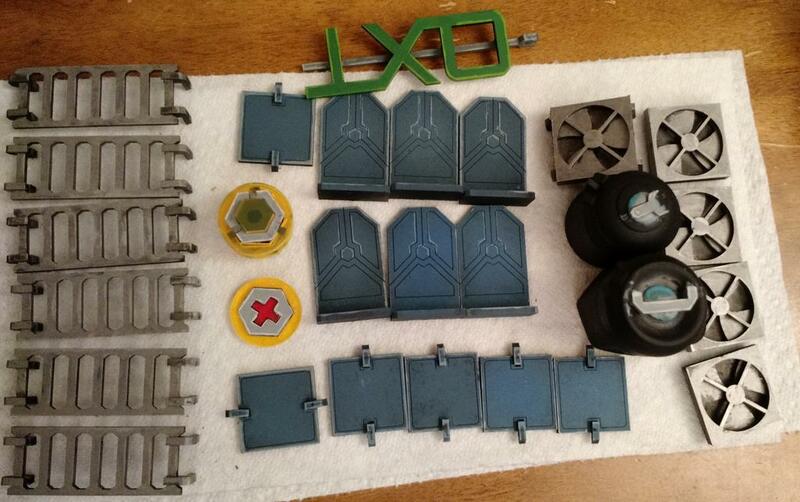 This allows for a player to use these pieces as they see fit and provides simple and easy customization options. However, this is the only thing I liked about these kits. I do not write these criticisms lightly. Building miniatures is a hobby that I choose to spend my free time engaging in and I want to enjoy that time. I am always more than happy to spread the word and share positive feelings about a game, a model kit, a paint or some other hobby product. It is small way to help out the companies that make products I like to use. The other side of that coin is true as well. If I have a product that failed to deliver, I feel people have a right to know that as well. With this principle in mind I leave you, the reader and fellow hobbyist with this; I cannot recommend Customeeple products.